Before you read Steve Jobs’ 2005 Stanford graduation speech (“commencement address” is the formal term), here are a few hints that might help you understand its background and some of the idioms and words he uses. -- To connect the dots means to see the hidden or complete picture. Some children’s coloring books used to have numbered dots that children could connect to make a picture. That’s what he’s referring to-- seeing the pattern of what’s really important. --“And since Windows just copied the Mac”-- he’s making a joke about the famous rivalry (competition) between his company, Apple, and Microsoft Windows. Steve Jobs was famous for his dislike of Microsoft and its way of doing business. --dropped the baton refers to the instrument passed from person to person in a relay race. If someone drops it it makes the whole team likely to lose. 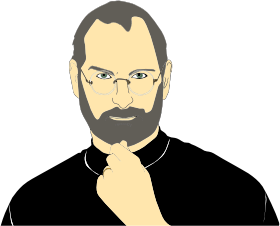 Read or listen to Steve Jobs' 2005 Stanford graduation speech (commencement address) here. --Why did Jobs say dropping out of school, being fired, and being diagnosed with cancer were good things for him? -- Steve Jobs encouraged people to take risks to “follow your heart” (do what you love) instead of just doing what others expect or do. He said that since we will die either way, we have nothing to lose. Do you agree?